Developing Leadership & Employee Engagement - Communication Works Inc. Communication Works Inc. Developing Leadership & Employee Engagement - Communication Works Inc.
Over 95% of all people will state they have been mismanaged. They will tell you that their performance was sub-par during this period and eventually leave the company because of the one issue—mismanagement. There are many definitions of what a good leader looks like. At the core of most definitions are qualities like personal accountability, interpersonal skills, humility, courage, futuristic thinking…where do you land in these competencies? Do you accurately see your strengths? Your areas of development? Communication Works delivers an 18-month Complete Leader process and program via Price-Associates, experts in the field of leadership. According to Ron Price, “Leadership characteristics are universal, while leadership practices are contextual.” This insightful, challenging and effective program will serve you and your executive team in each of these areas, raising the group to its highest levels. High performance teams have a blueprint for success – The Complete Leader program is an ideal map for individual and collective growth. The Complete Leader is a comprehensive leadership development system featuring practical applications for defining, practicing and becoming a high-performing leader. Through a combination of assessments, benchmarking tools, on-site workshops and self-directed activities, The Complete Leader provides holistic and measurable results. This fast-paced, deep-dive program measures participants in five sciences – competencies, behaviors, motivators, acumen and emotional intelligence utilizing the assessments from TTI Success Insights. If you are currently hiring superior performers but not managing them correctly, they will leave. If skills alone always led to success, then all people who have passed skill or knowledge tests would be successful For example, we know that not all medical doctors, lawyers, CPAs, nurses and chiropractors are successful. They have all passed an exam that certifies their knowledge and skills, but there is much more that contributes to success. In fact, we would be more successful in selection if we hired for attitude and focused on developing skills. Once you have selected your new employee, Communication Works will debrief them on their assessment results against the Job Benchmark. Your new employee will see their strengths and areas where they fell short of the Job Benchmark. Communication Works will provide the new employee with our new HRxPlan for individual development. This can also be integrated into your current Performance Evaluation System or it can become your Performance Evaluation System. Cultivating high potential employees who are already within the ranks to become superior performers means they will be ready to step up as positions open. Promoting internal candidates who have been specifically developed to the needs of the next-step position also offers an opportunity for the business to ramp candidates up to full productivity more quickly upon entering the new position. Time to effectiveness in the new role is abbreviated for the employee who is already acclimated to the company culture and goals, in addition to saving the time and resources that would have been spent on a candidate search. In the past, development often meant delays in delivery because of timing issues. Employees who genuinely needed immediate training for job effectiveness might be forced to wait months until the other seats could be filled. Getting all the right people in the room at the same time could be easily thwarted by travel, sick leave, vacations, etc., and in the meantime, performance stalls. We will provide you with a comprehensive understanding of the individual Behaviors, Motivators and core Talents needed to succeed in each position of your company. We will accurately assess your current team and train them in fun, informative workshops and we’ll provide a truly personalized coaching plan for each team player. We promise you pragmatic, practical application of what you learn. Bottom line–increased productivity and morale! Communication Works specializes in transformational change for salespeople and their approach to customer acquisition and customer retention. We will provide you with a comprehensive understanding of the individual Behaviors, Motivators and core Competencies needed to succeed in each position of your company. We will accurately assess your current team and train them in fun, informative workshops and we’ll provide a truly personalized coaching plan for each team player. We promise you pragmatic, practical application of what you learn. Bottom line–more sales! 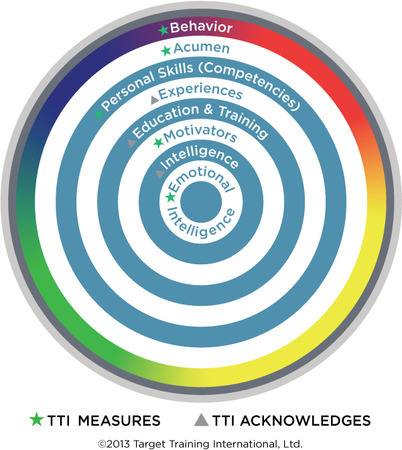 Identify the Behaviors, Motivators and core Competencies of your sales team using accurate, validated assessments from TTI Success Insights®.